Hydration is crucial all the time, but especially during the summer months when we endure hot temperatures, outdoor activities, and long hours in the sun. Water often isn't enough to quench our thirst, especially when we need minerals to balance electrolytes and keep us well-hydrated. Big companies know this… So we have them to thank for the sugary concoctions — Gatorade and Powerade — marketed to children and athletes. You see, Gatorade and Powerade (just 2 of many marketed sports drinks) actually work! They do replenish electrolytes for anyone who's lost a lot of fluid due to sweating. The problem is that they're also loaded with sugar, artificial colors, artificial flavors, and often GMOs. Not surprisingly, our ancestors knew the importance of hydration — long before science discovered electrolytes! So, they created traditional drinks — like switchel — to refresh and replenish after a long, hot day of sweating in the sun. No matter where it's from, switchel — also known as switzel or haymaker's punch — was served to men and women working in hot fields during the Colonial era. The saying goes, “Make hay while the sun shines”, yet hay-making (especially back then) is hard, hot work! Plain water was not — and still isn't — enough to replenish electrolytes and prevent dehydration. So, mineral-rich vinegar and molasses (or maple syrup or honey) were added to the water, along with fresh ginger, to quench the thirst of hard-working haymakers during a time before electrolyte drinks, like Gatorade, were invented. The basic ingredients of switchel are the same now as they were then: water, vinegar, ginger, and a whole sweetener. To produce different flavors of switchel, simply add fresh or frozen fruits and berries of choice! I think you'll also love my Pineapple Mango Switchel! It's the ultimate, traditional sports drink! Use it to replenish electrolytes after a workout, working outdoors in the heat, taking a sauna, or any other activity that heats you up and causes you to sweat. We even put it in our water bottles instead of water when we go on summer hikes! Switchel is also anti-inflammatory, pH-balancing, and very low in sugar. When made with raw honey, this Mixed Berry Switchel is even GAPS Diet- and AIP-friendly! 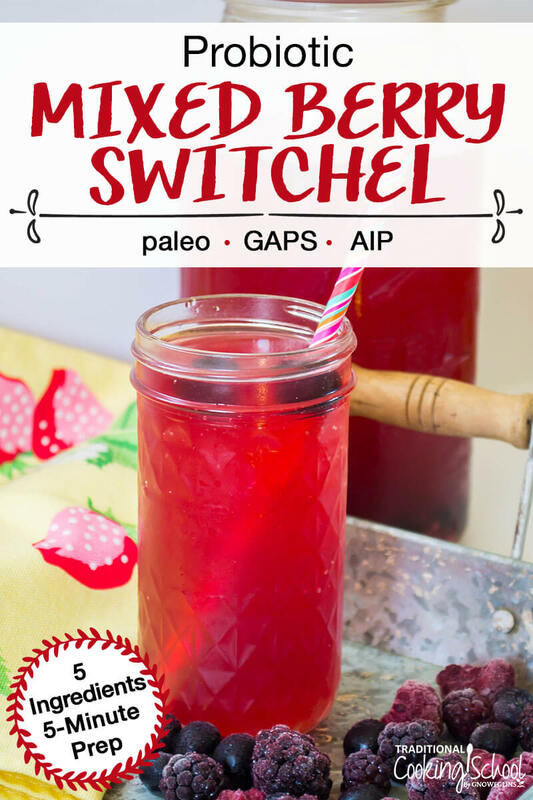 Making Mixed Berry Switchel couldn't be easier… even easier than water kefir and Kombucha! In fact, it's as simple as combining all your ingredients in a jar or pitcher and refrigerating for at least 8 hours. That's really it! Does Switchel Have You Puckering? If you noticed the raw apple cider vinegar in those ingredients and wondered about this drink being sour… you are correct! It is slightly sour, sort of like Kombucha. So, if you love the sourness of Kombucha, you'll likely love this Mixed Berry Switchel as-is. If, however, you just can't do the sourness, you can add extra sweetness without adding extra sugar by using stevia! I don't add stevia to the entire batch. Rather, I make the recipe as written, and then let everyone add their own stevia to taste when they pour their glass. If someone in your home is following the GAPS Diet or AIP protocol, they should not add stevia to their switchel. Our ancestors knew the importance of hydration -- long before science discovered electrolytes! So, they created traditional drinks, like switchel, to refresh and replenish after a long, hot day of sweating in the sun. 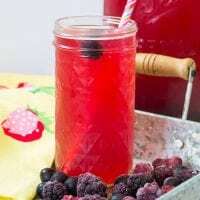 This easy and tasty Probiotic Mixed Berry Switchel has just 5 ingredients and a 5-minute prep! Add the ingredients in the order listed to a half-gallon Mason jar or pitcher. Stir with a wooden spoon until the sweetener is dissolved. Cover and place in the fridge for at least 8 hours or overnight. Serve, adding stevia if more sweetness is desired. Have you ever heard of or made switchel? What fruits would you add for flavor? I started making switchel a couple years ago. When I told my mom about it, she said my dad used to talk about his Aunt Dorothy making it for the corn-shelling crew and that he loved it. This would have been in the late 30’s/early 40’s in Southern MN. Made me happy to think I discovered something my dad would have loved. Wish he could have tried mine to tell me if it was what he remembered. My husband and adult children love it! I use raw honey, molasses AND maple syrup. My son likes his with a little cayenne in it! Could I use only stevia in the switchels or do I have to use honey or sugar first and then stevia at the end? The Apple Cider Vinegar is the probiotic. As long as you get one that is raw with the mother it will be full of good bacteria! In the raw apple cider vinegar. Would this be helpful after a stomach virus? I thought you weren’t supposed to refrigerate Apple Cider Vinegar because it will kill the good bacteria? Would you blend all the ingredients first or do you leave the fruits whole? Thanks, can’t wait to try this!